Wireless Home Security Alarms, Bradford, Halifax, Leeds, Huddersfield West Yorkshire. If you are looking to have a wireless alarm installed in Bradford, Halifax, Huddersfield or Leeds, then let us introduce you to the latest wireless alarm from Eaton. Earlier wireless alarms were found to be unreliable and prone to problems, in fact there was a time when we would not install a wireless alarm. However some 25 years on from the first systems and the latest wireless alarms from Eaton are just as reliable as wired alarms. The system uses the latest 868MHZ wireless frequency which is allocated for wireless alarms and security systems, this eliminates interference from other wireless networks and devices. This wireless alarm monitors all the devices on the system, each device has its own zone allocation and zone description so any problems like a low battery for example are reported to the control panel which has an easy to read LCD display informing the user of what the problem is, which device it is and the time and day it occurred making it easy to rectify. One of the most comprehensive and easy to use wireless alarm systems on the market, the panel can be turned on or off using a remote key fob or a 4 digit user code. Key Features, Professionally graded system. EN50131-1 20 wireless zones. Fully supervised system. 250 event log with date and time stamp. LCD English text display. Latest 868 MHz wireless technology. Advanced jamming detection in compliance with the highest industry standards. 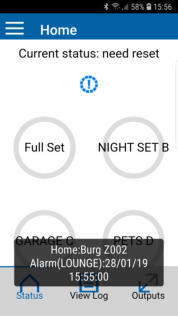 Full Set and 3 Part Set Options. Up to 3 year battery life. Wireless alarms professionally installed for your home Bradford, Halifax, Huddersfield & Leeds West Yorkshire. Control and receive notifications from your burglar alarm to your mobile phone. Free app and cloud connection via customers home network. 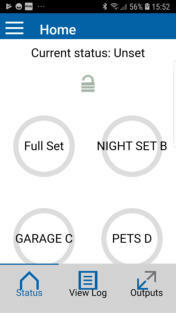 Set, unset and part set from any connected smart device anywhere in the world. Receive alarm notifications including zone description of area triggered. Earlier wireless alarms were found to be unreliable and prone to problems, in fact there was a time when we would not install a wireless alarm. However some 25 years on from the first systems and the latest wireless alarms from Visonic are just as reliable as wired alarms. The system uses the latest 868MHz wireless frequency which is allocated for wireless alarms and security systems, this eliminates interference from other wireless networks and devices. This wireless alarm monitors all the devices on the system, each device has its own zone allocation and zone description so any problems like a low battery for example are reported to the control panel which has an easy to read LCD display informing the user of what the problem is, which device it is and the time and day it occurred making it easy to rectify. 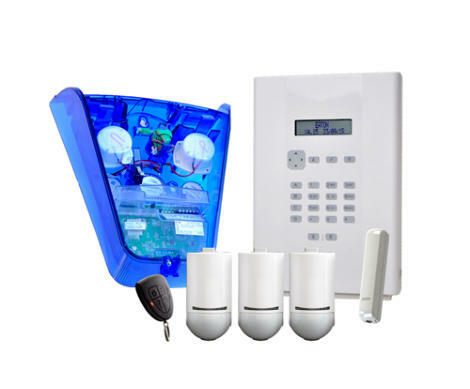 One of the most comprehensive and easy to use wireless alarm systems on the market the panel can be turned on or off using a remote key fob or a 4 digit user code. Key Features, Professionally graded system EN50131-1 20 wireless zones. Fully supervised system. 250 event log with date and time stamp. LCD English text display. Latest 868 MHz wireless technology. Advanced jamming detection in compliance with the highest industry standards. Full set and 3 part set options. Up to 3 year battery life. If you are looking to have a wireless alarm installed in Bradford, Halifax, Huddersfield or leeds, then let us introduce you to the latest wireless alarm from Eaton. Control and receive notifications from your burglar alarm to your mobile phone. Free app and cloud connection via customers home network. Set, unset, and part set from any connected device anywhere in the world. Receive alarm notifications including zone description of area triggered.